You would think that after two weeks of editing already that we would be further along than the prologue and five chapters, NOT! I am finding it almost as grueling as the rewrite. But, I did say, Almost. At first, we were proud how fast the first two chapters went. I had made a list, all be it a long list, but we had marked off two or three off the list and we were moving forward. Then, the thing happened. The, we need to change this and it will change a lot, thing! Now, I feel I'm back to square one and I'm not happy about it! Next, a few more major changes were found, will this ever end? So frustration kicks in and I get a little pissy! We now know we have to add a piece to the book that could take a lot of work and I am not mentally prepared. Do I want to add this, or not? It could do a lot in enhancing the story, but it would take some serious work. I took a day to process this information and try to work it out in my mind. Thank God for my sister, or I would be lost in the fog of words and drift to never never land. She let me stew, (and vent) and now the day is brighter and I can move on to deal with the task at hand. Yes, we will figure it out, it will just take a little longer than I expected, but the book will be better for it. I knew, (deep down) that this could happen and again, my usually patient self is being tested. But, moving on, soaring higher, hoping that I can get this done before the end of the year. That's the goal anyway. Can I reach it? Should I worry about it? I guess the point is, I can't always reach every goal on time. I mean, after all, it took over a year to rewrite the book, it could take longer than I expected to edit it. I feel better about it since I took a day to comb over it all in my mind and I am ready to get back at it tonight. It will come to its fruition and I will finish it, when I don't know, but I will finish. Has this ever happened to you? Whether writing a book, or anything else you had set a goal to? Leave me a comment and let me know your thoughts. I also love advice since quite a few of my blog followers are writers and I'm sure they've been where I'm at! Lisa, don't despair! The editing process is always a bear, and always full of nasty surprises. Persevere. You will get there. It's better to release a polished project to readers than to have them chide you for shoddiness and possibly damage your reputation as a writer. I think you're probably taking a wise approach. Thank you Arlee and E. I appreciate your support and advice! I am going to do it right, that's the plan and I guess I need to be patient and know that I want to put out the best I can do! You comments are much appreciated! Ah, goal is a four letter word! Edit is too. 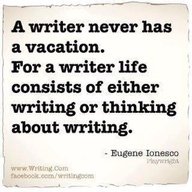 Both are the bane of many a writer's existence. Unfortunately, both are also necessary. A good friend of mine once said that we are sent strife and difficulty to help us burn off the dross that covers us in order to reveal our inner, more capable and self-confident selves. Hang in there and know all these edits, additions, and cuts are all a process. In the end, what you produce is going to be awesome and so worth it. Believe me when I say, this happens to every writer who cares about their trade. It took me about a good three years to write my first book. It has been sitting at a publisher for since March and I am still waiting on an answer. So hang in there. Meanwhile I am working on book two of the series, have had a short story published that took a year to write and have published by a Canadian publisher, and writing my own blog articles and articles for others, not to include two other books I am writing. So join the club dearie. You are going to like it. Thank you ladies for your support and enthusiastic words. You are both wonderful and I appreciate the cheering on! I agree, it is what I care about. Even though my book is self-pub I want it to be the exception, not a badly written work. I want those who give it a chance to be pleasantly surprised! Thanks again for your comments and cheers! It's so good that you're spending so much time with editing and rewriting. A good writer is a good editor. This will set you apart from the self-published authors who can't be bothered with it. It gets easier too the more you write and develop your voice. Thanks Teresa, I appreciate your support and pat on the back for hiring an editor! I want my book the best it can be and wouldn't have it any other way! Sorry I haven't responded sooner. You've gotten some really good responses and I'm not sure what I could add. We've talked before on how both of us feel about releasing a polished product. You also know that I'm doing a rewrite of several chapters, all for the sake of making the book better. I think we owe it to ourselves as well as our potential readers to create the best story possible that will draw our audience in and take them away for awhile. That's our ultimate goal (there's that four letter word). You're very passionate about your story. I would be surprised if you called it good at this point. With that said, there will come a time when you need to. Here's my warning. You can over edit. When your gut says its ready, listen to it. You have a fabulous tale. It's going to be a fantastic YA series! Because I've read a lot if it and have critiqued it, I can say without a doubt that you are closer than you may think right now. Whatever your changes/additions are, I'm sure they will enhance the book. I'm looking forward to seeing what you come up with! Thanks Robin and you will be seeing the changes in our critique group! yes, we can over edit but this needed in because of the prologue! As always, thanks for your support! What do you think of my new template for my blog?